Celing level decorative diffusers that transform daylight into a decorative style that complements any decor. Power supply for controller (KES 160). Allows the user to control the amount of daylight that enters a room and perfect for rooms that require room darkening. Power supply for VELUX SUN TUNNEL light control devices. 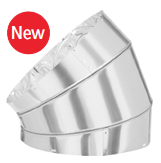 The VELUX ZTL electric light kit enables flexible and rigid VELUX SUN TUNNEL skylights to be used as a light source even at night. A tile flashing kit is available for SUN TUNNEL skylights being installed on tile roofs. Designed to increase the energy efficiency of the VELUX SUN TUNNEL and enables your SUN TUNNEL to exceed the ENERGY STAR® requirements. A durable and easy to operate elbow that can be used at thetop, bottom, or middle of your installation. Multiple elbows can be joined together with rotating couplers to form a 90° degree bend or any configuration needed to maneuver around obstacles. The light-controlling chandelier presents daylight in an elegant manner while increasing light dispersion. It is an accessory for the 14” SUN TUNNEL™ skylights that produces a beautiful light reflectance to the room while allowing the user to adjust the light by raising or lowering the chandelier. Flexible extension tubes are available for flexible SUN TUNNEL skylights. Installs in minutes, easy to operate, blocks out the light when not wanted. For 10" and 14" SUN TUNNEL skylights.